This entry was posted on Tuesday, August 23rd, 2016 at 3:28 pm. “Every Ride, Every Time.” That’s the motto most of us equestrians live by when it comes to our helmets. Keeping our noggins safe is our number one priority, but that wasn’t always the case. When riding headwear was first introduced two centuries ago, it served one main purpose – fashion. A variety of hats emerged in the 1800s: the top hat and the bowler hat. Foxhunters were fond of wearing these out in the field because they exuded style and class. The top hat, also known as the high hat, silk hat, or chimney pot or stove pipe hat, was invented in 1797. Sometimes called the “topper,” this hat is tall with a flat crown and broad brim. While foxhunters no longer ride to hounds displaying such finery, the top hat is still worn by advanced level dressage riders. The bowler hat, also known as the bob hat, billycock, and most notably, the derby hat, was invented in 1849. With a hard felt shell and a rounded crown, the bowler hat was originally created for the British soldier and politician, Edward Coke. Shortly after the end of the Victorian Era, it became popular in the United Kingdom with middle and upper class equestrians because it looked tasteful and would not blow off easily while riding. In 1911, Charles Owen began manufacturing cork helmets in London for the military. By 1928, the cork helmet was being covered with a hard exterior and became the first motorcycle helmet. Ten years later, Owen developed its first racing helmet, and the equestrian world was changed forever. However, these initial helmets lacked the safety features that we have today. These caps were typically just hard plastic shells covered in fabric, and they did not have chin straps for security. They were, however, still fashionable. 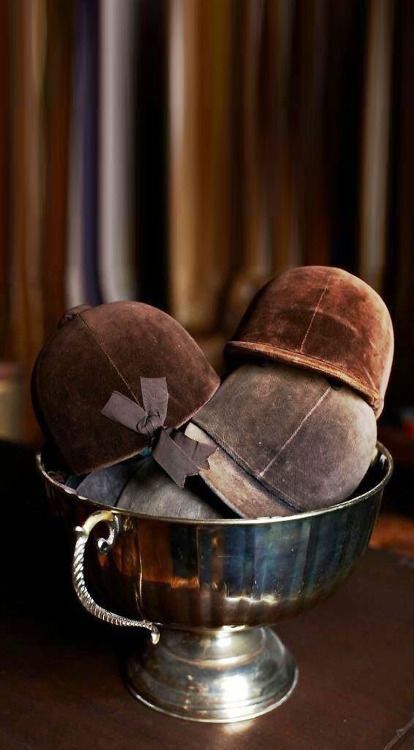 Sleek and refined, these caps were covered in black (and sometimes brown) velvet or velveteen and were the final piece of an equestrian’s stately riding habit. Not just fashionable pieces, helmets are used as communication tools too. Have you ever wondered about the significance of the ribbon on the back of your helmet? These ribbons were strategically placed pointing up or down in order to communicate with riders while out foxhunting. The Masters and other professional staff signify their positions by turning their ribbons to point down. Amateur staff and other members of the field should have their ribbons pointing up. While out in the hustle and bustle of the field, a quick glance at the back of a hunt cap will let you know the ranking of the foxhunters riding alongside. By the latter half of the twentieth century, those who partook in the more dangerous riding disciplines, such as show jumping and racing, began to require headgear that also served a protective function. In 1986, the United States Pony Club asked the ASTM (American Society for Testing and Materials) to develop a helmet for equestrians. The first ASTM/SEI certified helmet was developed in 1990. Today, while helmets are mainly worn for safety, we equestrians also want to make a statement in the show ring. While the traditional black velvet or velveteen helmet is still prevalent, the “skunk helmet,” a recent creation, is gaining in popularity in the hunter/jumper world. These helmets have a smooth finish, a slightly textured plastic shell, and an attractive ventilation strip down the center, giving it the nickname, “skunk helmet.” Less conservative by design, these helmets make a statement, allowing riders to display some individuality in the show ring for the first time ever. Some even adhere bright, colorful monogrammed stickers to the back. It’s a great time to be an equestrian. Our current helmets are safe and fashion forward. We have the luxury of showcasing our distinct personalities, adding some pizazz in the show ring, all while knowing that our heads are sitting pretty, safe and sound.